I will be adding to it, when/if, I can. I just had a refreshing morning. Babies 2 and 3 and i travelled over the bridge for our weekly food shop at my favourite supermarket in the bay – Mount New World. I love it for it’s house sized window, which allows for an everchanging view (sometimes of the trains) and natural light which must aid to feed the most friendliest happiest checkout operators ever known. Today it set the scene for two confluent exchanges. Yesterday, after going to Sanfords for our fresh fish i noticed the most stylish billboard publicising an event in Tauranga -“Butterflies of the Night”. I thought to myself – i must google ‘butterfly, tauranga’ when i get home. Didn’t. This morning, Nelson, said hello to my adorable babies 2 and 3, and we got chatting. Turns out he is writer and probably many other hats, for the ”butterfly, tauranga” show I was s’posed to ‘ogle’. Go people. Go. I don’t think I can cos I’m still feeding and soothing babies 2 and 3 at 7pm nightly. But you should go. The tabled seats have all sold out but the terraced seats are around $90 and show from the 14-18 April. There’s a matinee on the Saturday. The show sounds like a visual, sensual, aural feast – and a rarity to be given to our Bay audiences. These descriptions stuck ‘in’ me: Internationally sourced (from e-bay and the like) historic gowns and undergarments modelled by gorgeous young and not so young women from here and abroad. Spanish stars singing cabaret style. An antique puppet. Romance. Boudoir. Location: Classic Flyers. Grandeur. In the same supermarket expedition, we all (baby 2 and 3 and I) greeted some of the Wallis Island sevens team. Turns out they speak French in Wallis Island. Turns out, so do I. Confluence here: our shower curtain is a world map and just this morning I was marvelling at ALL the Polynesian islands, and musing that I thought Samoa was south and Tonga north, and noticed Wallis Island. I’m not sure I’ve ever clocked it before – sorry Wallis-landers. TONIGHT 5.30pm – 9pm Thursday 26 March FOOD. Dinner in the Domain. Dinner in the Domain is a weekly artisan food market held in the idyllic Papamoa Domain. The best of the best that the Bay has to offer. The last one for this season, not to return till November. TONIGHT 7pm Thursday 26 March. MUSIC Bella Kalolo: $25 for adults and $20 for Students and Friends of the Gallery. Location: Tauranga Art Gallery. I heard friends rave about this as a venue, commenting that the intimate and styley fresh setting is a dynamic combination. Who says we don’t have great things happening in Tauranga. 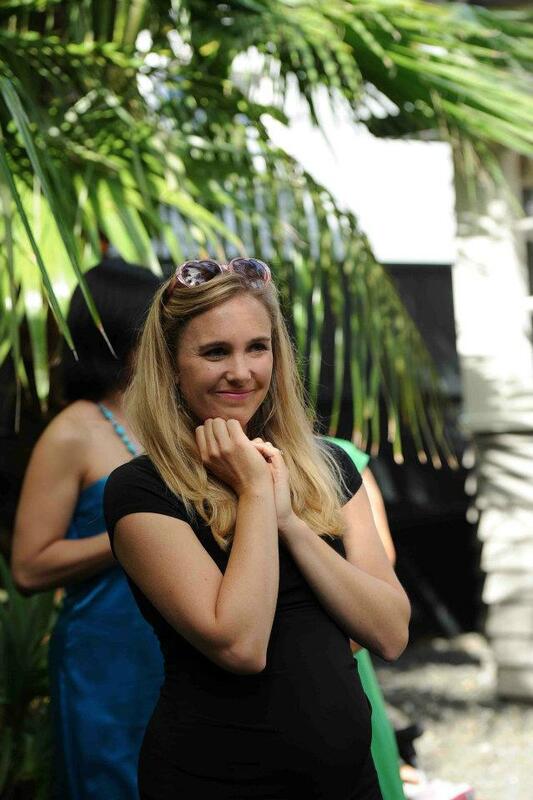 When we go to these events, organisers get happy, artists get happy, Tauranga gets happy. More happy is good Tauranga. 28 March – 11 April VISUAL ART New Works – New Walls. Zeus Gallery. Painting. Sculpting. Printmaking. Installation by some of Tauranga’s favourite artists. 7:30-9pm Friday, March 27th FILM. Introduction To Permaculture. Location: Wesley Centre 100 Thirteenth Avenue. Entry by gold coin donation. EASTER 2- 6 April Music National Jazz Festival Tauranga. EASTER 3-6 April Prana Retreat. 4 Days of Transformational Workshops, Healthy Food, Yoga, Dancing & Eco Market Stalls! Opoutere (near Whangamata). This is rumoured to be the last Prana Retreat as Tom the owner of the land has passed over, and the land is on the market to be sold. SCHOOL HOLIDAYS include Easter and so go from Friday 3 April until Sunday 19 April. 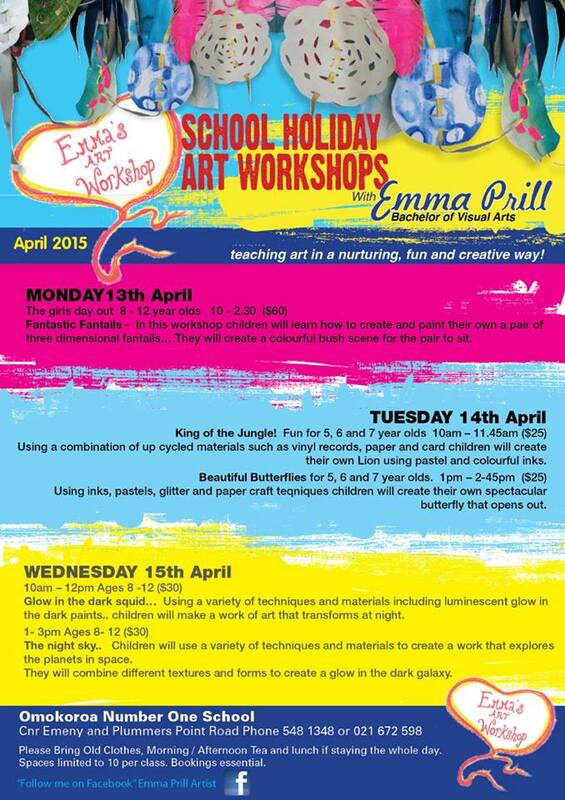 7-17 April 10am-12pm CRAFT Craft Collective are running workshops for kids and for adults. $25. 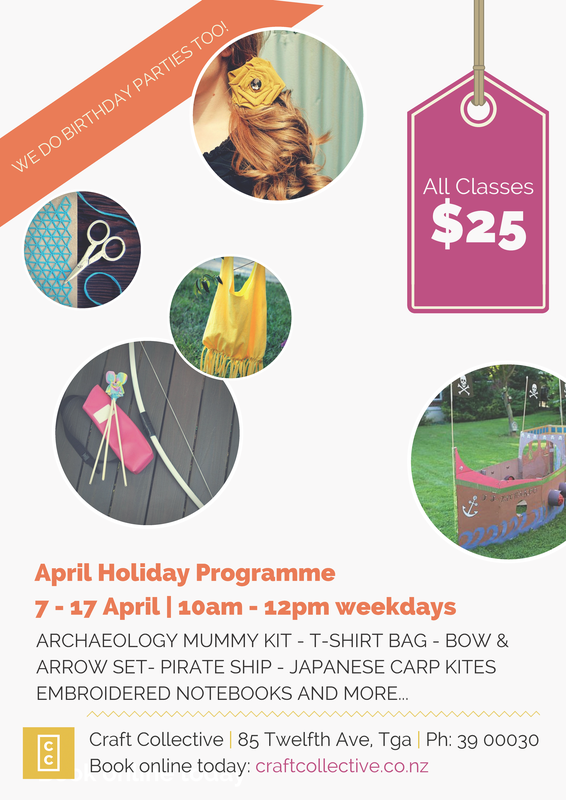 8th and 15th April 9:30am-12pm CRAFT WORKSHOPS FOR KIDS Craftea Art Classes held in Papamoa East. Photographic transfer onto wood art project. Running two sessions (same lesson twice). $30 per child. Book through their facebook page. 14-18 April THEATRE “Butterflies of the Night” is a multi-layered show incorporating theatre, song, music, dance and audio visuals. Emotion and fashion woven on the same loom, the show weaves its way around an international love story. Set in the wardrobe department of a Parisian Cabaret called “Papillon”, “where hearts and souls take flight”. Prepare for a 2 hours 15 mins long extravaganza. 10am-1pm Sunday 19 April NUTRITION Sauerkraut and Bonebroth workshop. Nourish yourself and those around you with these 2 foods that are packed with nutrition. Children will love our Sauerkraut and both are very easy to make. We are open for bookings now so join us and top up your health for winter. Sunday 19 April FOOD Kinfolk gathering. Tauranga’s gathering will be a celebration of food grown beneath the surface, whether that may be within dirt or under the sea. Our chef Nadine Bailey of Devour Catering NZ, caker Danielle Cubis of Spongedrop and food stylist Aimee Finlay of hope & organic will be putting together a seasonal 5 course lunch in the gorgeous ivy walled courtyard of Ataahua garden. 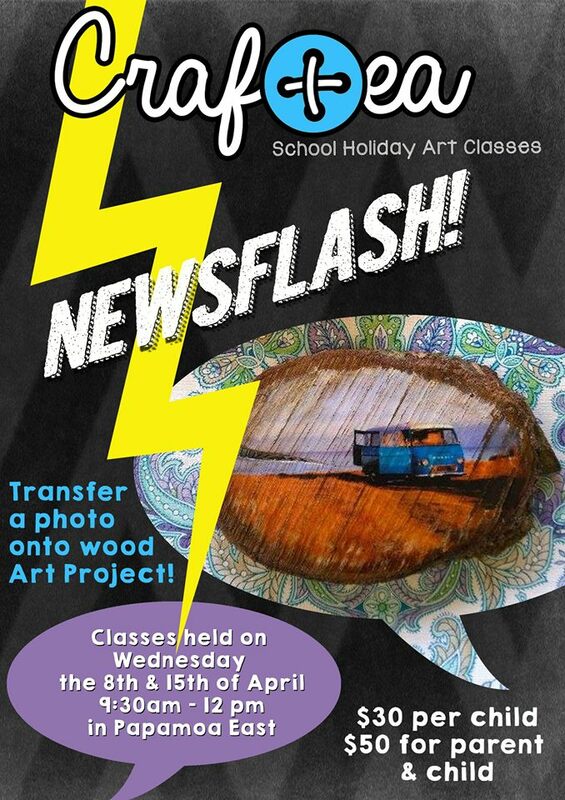 Saturday 25 & Sunday 26 April VISUAL ART WORKSHOP. If you missed Emma Prill’s school holiday art classes take the ‘sprogs’ or your own beautiful self to a ‘make your own paper wreath‘ to honour anzac day, at Tauranga Art Gallery. 6pm Friday 1 May VISUAL ART Celebrating OD. Owen Dippie is leaving Tauranga for NYC, to return to NZ to make Auckland his home. Come to this presentation of paintings and print sale. There’s a screening of the doco “The Radiant Child” at 7:30pm. Refreshments and cash bar. FREE ENTRY *limited capacity. Location: Tauranga Art Gallery.